Maria Halcyon looks out from the stage at a Gilead concert. Remarkable French harpist Sylvain Blassel is best known for for his unarranged, note-for-note, performances and recording of Bach's Goldberg Variations. This is a genuinely extraordinary accomplishment on harp. As you might expect, Sylvain did not get there magically, he spent (and still spends) hours upon hours each day in practice. Interestingly, while he does most of that practice on one of his restored, antique pedal harps, he also uses a Rees Flatsicle™ Harp. He tells us that he likes to play his Flatsicle™ Harp while on the train commuting or even while he sits up in bed in the evening and an idea comes to him. He likes to practice specific runs to reinforce the muscle memory in his hands. The little, light Flatsicle™ Harp isn't a harp he performs on but it is a part of building his sparkling performances. At the other end of the musical spectrum, Maria Halcyon, of the Russian punk-folk band Gilead, takes her Flatsicle™ Harp to a whole new place as she dances wildly on stage while playing, completely overtaken by the music. 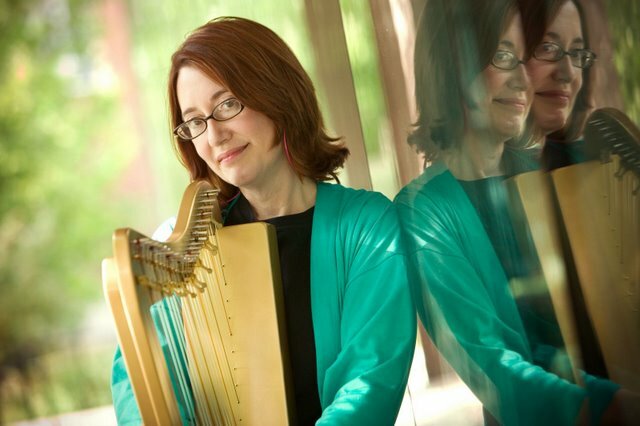 American pedal and lever harpist Christine Van Arsdale teaches and performs widely with her larger harps but loves her little Flatsicle™ Harp because it is so easy to take out and about. Rees Flatsicle™ Harps make it easy for even the most highly skilled harpists to have at least one harp they never worry about or have to treat as "precious." For these skilled, dedicated, intensely focused musicians, Flatsicle™ Harps represent... well... freedom. The Flatsicle™ Harp has sharping levers installed on the C, F & B strings allowing the player to play in the keys of C, D, G, F and the relative minors. On this instrument we recommend that the B-string be tuned down to B-flat and sharped to B natural for the keys of F and D-minor. As with the Sharpsicle™ Harp, the Flatsicle™ Harp can have levers added later as needed. This model is extremely popular with music therapists and is recommended by the International Harp Therapy Program. It comes with a string chart and tuning wrench. Are you considering levers on all the strings? Most Flatsicle™ Harp owners are taking their harp out and about often so a Harpsicle™ Bag will be a necessity. For all those who take their harp away from its home base regularly, we also recommend our 911-HARP Kit which contains things like an extra set of strings. Many Flatsicle™ Harp owners also chose some of the pro upgrades like having a built-in pickup added or our popular bass strings upgrade which adds wrapped strings into the lowest octave. Also, for those who prefer to stand and play we have our new, solidly built and balanced, Standing Stand. The Standing Stand for Harpsicle® Harps turns your Harpsicle®, Sharpsicle™, Flatsicle™, Fullsicle™ or Special Edition Fullsicle™ harp into a floor harp that you can play standing up making it easier to be played, displayed, and to stand on it's own for your performances. This incredibly sturdy Standing Stand pivots the Harpsicle® Harp to different angles and adjusts to different heights for a perfect fit. The bottom of your harp can be elevate from 23" to 33" off the floor. Only available in natural wood with metal legs. This stand does not work with the Grand Harpsicle® Harp. To play your Grand Harpsicle® Harp standing, choose the Grand Harpsicle® Standing Stand. Our customers send us (or we see on YouTube) all kinds of videos - and by that we mean just about everything you can imagine. Some have truly amazing, professional production values while others folks record their experience with their Harpsicle® Harp from the very first time they touch the strings. Each story, every single video, is wondrous because they share so much about the myriad of interesting, inventive people who play our harps. The Bad Harpin' Romance video here is by Canadian musician and composer, Matthew Tran-Adams. Matthew had fun making this video and, knowing him, he had to work pretty hard to keep that straight face. Matthew is playing the harp, djembe and the synth bass in this arrangement. American harper Steven Rees (no relation) playing at the Christ Church just inside of Jaffa Gate in Old City Jerusalem, Israel. See his website at http://CalmingHarp.com for more.